** FREE POSTAGE within Australia, postage overseas at cost -- Note: Postage will be added automatically when you place an order, but I will adjust the postage cost when the order is processed. ** As the Austrian army collapsed under the onslaught of Prussia’s Elbe Army, the Saxon Army on its left, under Prince Albert did its best to redeem the situation. Unfortunately the pressure was too much and they were forced to retire, which they did in an orderly manner. It was also in an orderly manner that Albert marched his troops, who had fought with honor, across the Elbe and away from the battlefield and into the history books. Königgratz would be the last battle that Saxony fought as a fully independent Kingdom. 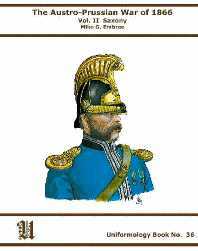 This book traces the story of Saxony’s participation in Second Schleswig War of 1864 to the end of the Seven Weeks War in 1866. 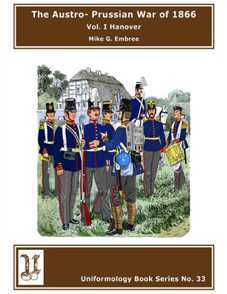 The author describes its organization, tactics and uniforms of the period. It is illustrated with prints by Bruce Bassett-Powell, Richard Knötel from the Uniformenkunde and his son Herbert from his work with Martin Lezius. Plenty of uniform details and schematics also accompany the text. This item was added to our catalog on Thursday 23 September, 2010.